Easily cut by Customer? Yes: Hacksaw, Jigsaw, Knife, etc. Ashford, white faced MDF decorative screening panel. White faced MDF decorative grille panels are pre-finished in white so no need to paint in this most popular of colours. 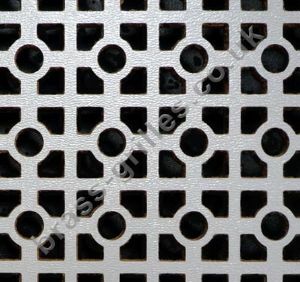 This decorative grille sheet is ideal for grilles in radiator covers, cabinet and door inserts, custom ventilation and general interior screening uses. Farnham decorative screening panel in white faced MDF. Ashford decorative screening panel in oak veneered MDF. Sheet Size: 6ft by 2ft. Approx. 1830mm x 610mm. Ohio decorative screening panel in white faced MDF. Farnham interlocking circle design decorative screening panel in oak veneered MDF. Oregon 28mm cross shape design decorative screening panel in white faced MDF.